One of the many apps that were updated during last weeks iOS 8 update storm was Instapaper. This marks the first major update since Marco Arment sold the app to Betaworks last year. Instapaper is an app that allows you to collect articles to read them later. It’s the app that defined the category of ‘read it later’ services, which today is populated not only by Apple (integrated in Safari) but also many other apps. What makes it invalueable for me as a productivity tool is the ability to not only store articles and webpages for later but also organize them into folders. That way I can separate articles for different areas of my life (job, projects, private reading, …) and store them in one, convenient place. Ever since I encountered Instapaper a few years back, one of the biggest issue has been to get articles into it. A few apps (like my favorite RSS reader Newsify) have integrated the SDK and there are bookmarklets to save things from your browser, but it just wasn’t as easy and ubiquitous as I’d like it to be. 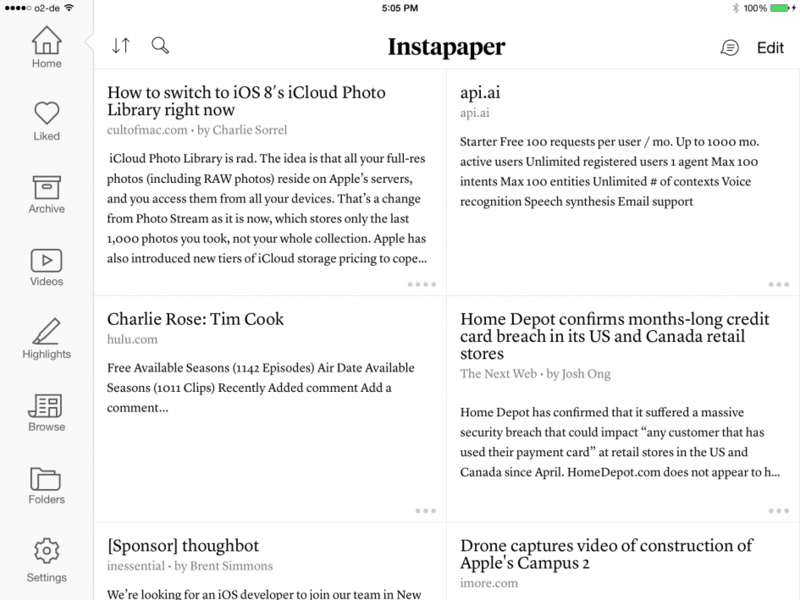 Now with iOS 8’s extensions, Instapaper can finally be used in almost every app. Just bring up the share sheet, tap Instapaper and the link will immediately be saved to Instapaper. The app itself is free, additional features (like searching or text-to-speech) require a $2.99/month subscription. My pick for this week is my shiny new [iPhone 6 Plus] (http://www.apple.com/iphone-6/)! After spending 5 days with the device, I love the larger screen, the improved camera, the better battery life, and iOS 8 in general. My phone has become such an important aspect in my daily life that all of these improvements add up to a fantastic phone that allows me to take a video, edit it in iMovie, and then post it to the web…all in one device! Within time, we will also see applications that will take advantage of the larger screen size. The best example of applications that already take advantage of the larger choice would be the Messages app and Mail app. The messages app now shows the contact person’s avatar and more text while the Mail app looks more similar to what you would see in the iPad’s Mail app. I cannot wait to see what other cool usage ideas the community will come up with!